Carlos daughter is a brand famous in the United States. For the past 20 years, it has been nurturing hair of most American girls. The brand beats records of popularity primarily because it excels in nurturing and styling afro hair – very curly, extremely difficult to style and maintain. 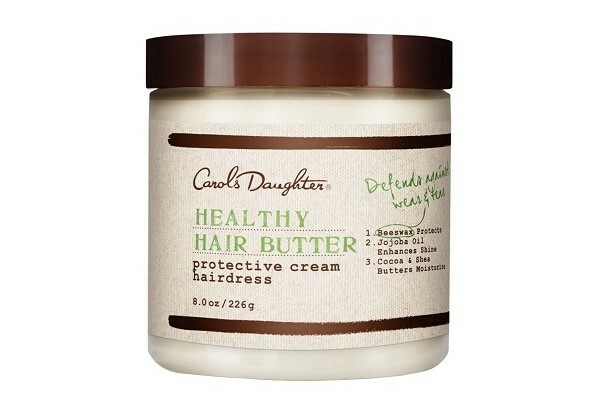 One of the products especially worth recommending is Healthy Hair butter – protective hair butter. Its main task is to protect and care for hair of low as well as medium porosity. It is a product of 226 g capacity. It does not contain any mineral oils or paraffin. Thanks to extracts from lavender, lemongrass, rosemary and oranges, the oil has a beautiful and refreshing scent. The packaging is very pretty: eco styled label in the shades of beige and bronze. Healthy Hair butter is hidden in a simple, clear jar with a black lid. The product comprises a diversity of components. Apart from shea butter and coconut oil, you will find the following oils: soybean, jojoba, sweet almond and corn. Three ingredients with a buttery consistency are perfect for low porosity hair. They are well absorbed, do not weigh strands down but protect it against damages providing silky softness and smoothing at the same time. Almond and corn oil have a bit bigger particles, however, their amount in the Carol’s Daughter butter is appropriately matched not to overburden thick and heavy strands. Moreover, jojoba oil can be referred to as ‘universal’ – despite the majority of monosaturated fatty acids. Its main task is to regulate processes taking place on the scalp. Oil will moisturise over-dried scalp and also prevent from excess sebum secretion. All women who have thick, coarse hair, but also those whose strands lost good condition (due to frequent colour-treating) can reach for Healthy Hair Butter. Additionally, the cosmetic will be ideal for such hair type that is oily at the roots and dry at the ends and require specialised and more intensive care. Healthy Hair Butter can be used in a few ways, because it does not have just one purpose. As styling hair paste, facilitating the process. Healthy Hair Butter is a versatile, high end product. In The United States, it is famous for over 20 years. Well combined ingredients allow you to use the cosmetic not only for care but also for styling. Lack of chemical ingredients, parabens and mineral oils means that Healthy Hair Butter is suitable for nurturing and taming unruly wisps of children.